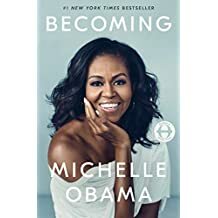 My best book of the year: Becoming by Michelle Obama – Joyce's mystery and fiction book reviews with some non-fiction too! This book has gotten so much advance…advance money, advance ticket sales for the tour, advance praise from many, including that magical bookseller, Oprah Winfrey. I wondered if it could possibly be that good. My own answer is, Yes. It is that good and more. This book is compelling not only because of the fame that Ms. Obama has achieved and the incredible accomplishments of her husband and herself. It is also compelling because it is a universal story of a girl growing up. She is a girl with a secure family and also knowledge of the struggles her family faced and the inability of some of them to achieve their dreams because of their race. It is the story of parents who wanted the best for their children and raised them to be independent. It is the story of a girl who wants the best education she can have, even when a high school counselor tells her she is dreaming too high. It is the story of a young woman who goes to the college SHE chooses and is aware of her minority status just about always. The young Ms. Obama is driven and direct; she so very much wants to achieve and does. But…and this is important, she is able to look at her life and think about whether being a lawyer, for example, is what she really wants. At such moments, Ms. Obama is open and candid. Michelle Obama, as we all know, meets a young intern at her law firm. The story of their courtship and marriage resonates. Her descriptions of Barack Obama make me wish that I could know him for his remarkable mind, optimism and caring. Yet, marriage is work is what comes across; life is not all fairy tale and the reader wants the best for this couple throughout the book. I have not yet finished Becoming so may write more later but truly I urge you to read or listen to this one. It is so very much worth your time whatever your political persuasion. I am listening to the audio version of this book as it is Michelle Obama who narrates it. I adore hearing her voice and her emphases as she reads. I both want to finish this one and not finish it so that I can still have it to look forward to! Five stars and more! Most highly recommended. I really want to read this book. It’s on my TBR. However, I do tend to not like autobiographies, simply because the writer chooses what to include and what not to include, thus painting a not often realistic picture of who they are (usually to make themselves look better). However, I just love Michelle Obama’s fashion style, and I don’t know much about her life, so I’m curious to read it. I have the hardback and the audio, too, so she can read to me! Love that this is your favorite of the year and wonderful review!